Acharya Charaka has enlisted three methods to get profound knowledge from Ayurvedic treatises, viz., Adhyayana (study), Adhyapana (teaching) and Tadvidyasambhasha (scholarly discussion), whereas Acharya Sushruta has quoted four factors or qualities which enhance the intelligence and retention power, viz., Satatadhyayana (constant study), Vada (discussion), Paratantravalokanam (studying other branches of science) and Tadvidhyaacharyaseva (following the learned preceptors in the respective branches of knowledge). Thus, utmost importance is given for Adhyayana (study) which is not an easy task as the treasure of Ayurvedic knowledge is encrypted in the form of verses characterized by 'Padairalpam Matimbuddhwa' (larger application with minimal words). It can be explored with the help of Sanskrit grammar which comprises Shabdartha (meanings), Sandhi (conjunctions), Samasa (compounds), Vibhaktipratyaya (cases) and Alankara (figure of speech). Sometimes, mere translation of the original verse may not give exact idea of the author as it depends upon various factors such as the context, time and place etc. To over come this, various maxims have been brought into limelight by the different commentators. Maxim is a brief statement that contains a little piece of wisdom or a general rule of behavior which can be tricky. The defining characteristic of a maxim is its pithy – that is, it contains deep meaning in just a few words (nugget of words). Maxims are also known as a type of proverb, saying, adage, sententia or precept. Maxims are nearly the same as aphorisms. The only difference is that maxims are often straightforward whereas aphorisms tend to use a metaphor; maxims may or may not do this. In classical rhetoric, maxims were regarded as formulaic ways of conveying the common wisdom to people. Many of these though based on stories or incidents that might have occurred in the past are equally relevant even till date. Maxim acts as a mathematical formula or a tool to derive the exact meaning of the context and thereby helps to reach the original intention of the author which will be helpful for the better understanding of the treatises. Even though maxims are sagacious, they not only enhance the text or literature but also provide scholastic blush to it. Based on the existence, they can be categorized into two types, viz., Laukika (conventional) Nyayas and Shastriya (classical) Nyayas. Laukika Nyayas are used in the day-to-day life that strengthens the conversation whereas Shastriya Nyayas are helpful to beautify and aid in better understanding of the literature. In Ayurvedic literature, these maxims are used in two ways, viz., maxims in original verse and maxims in commentary. Shringagrahika Nyaya (SGN) is traced in the commentary and it means holding the horn of a cow or ox to indicate it, particularly from others in a herd. In a herd cows, the best way to indicate a specific cow is, by holding its horn only. The main intention behind this Nyaya is to specify a particular thing in a group of similar ones. To explore the significance and necessity of SGN in those particular contexts. For the present review study, original text of Chakrapani's AD commentary of Charaka Samhita edited by Yadavji Trikamji Acharya was thoroughly screened and other available translations in various languages, published articles in peer-reviewed journals, published books and other subject-related material available online were referred to compile, analyze, organize and describe the different contexts of SGN in a systematic manner. In Shadvirechanashatashritiya Adhyaya, after the description of 50 Mahakashayas (classification of drugs), while concluding the chapter, it has been mentioned that 500 drugs have been put together into 50 (Mahakashayas) and they have been described by definitions or indications (Lakshana) and illustrations (Udaharana). Five hundred drugs (when they are counted as one by one or as individual) are grouped into fifty Mahakashaya (Sub-groups) on the basis of a specific character, i.e., similarity in their therapeutic action. In this context, Chakrapanivisualized the situation with the help of SGN as in which to indicate a cow from a cattle group. Similarly, the total drugs in 50 subgroups are 500 in number when they are counted individually like holding a horn of a cow in SGN. Here SGN is used in a positive perspective to justify the present context. Positive perspective means where there is a specific description provided by the author in original verse and is justified by the commentator with the incorporation of SGN. Hence, in this context, the SGN has been used as an example or illustration to explain it in a lucid manner. In Swedadhyaya, while instructing about the pre- and post-managements of sudation, it is stated that after proper oleation, a person should be administered sudation. When duly fomented, he/she should be kept on wholesome diet. After sudation, person should abstain from exercise. The details of the wholesome diet are not specified in the original verses. Acharya Chakrapani in his commentary has quoted that after proper sudation, a patient must follow wholesome diet or Samsarjana Krama. As per SGN, details of the wholesome diet are not specified here; in this context, all such diets that are responsible for the alleviation of Pitta are to be considered as wholesome to counteract Pitta Dosha which is aggravated during sudation. The reason behind non-specification of Pitta-alleviating diet articles is to avoid unnecessary expansion of text and repetitions as delineating each Pittahara Dravya (Pitta pacifying drugs or diet) by its name is practically lengthy as well as impossible. Thus, the context is made more comprehensive by incorporating SGN in a negative perspective. On contrary to positive perspective, when there is no specific description or vivid explanation of the context in the original verse and is justified by following SGN, then the context comes under negative perspective. In Annapanavidhi Adhyaya, after the brief description of various types of diets and drinks at one place, it is stated that only such types of diets and drinks are taken into consideration which are most commonly used by people. It is even impractical to enumerate all the drugs by their names as it is said in the previous chapter, i.e., Atreyabhadrakapyiyam, 'that there is no single substance in the universe which cannot be used as Aushadha (drug).' 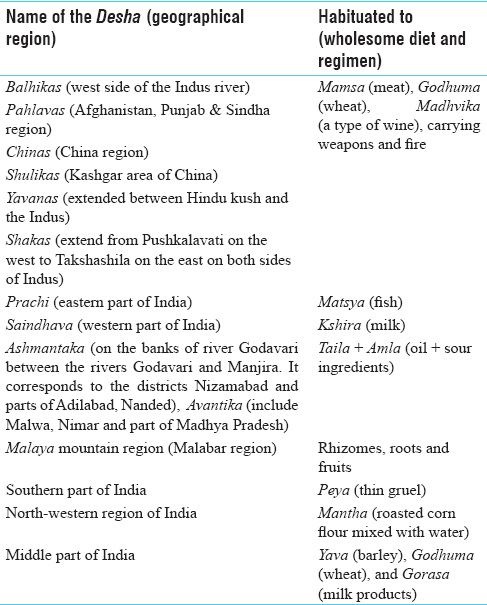 Properties of the drugs which are not mentioned here have to be understood by considering their geographical region. It is opined that properties of some selected drugs pertained to Anna (diets) and Pana (drinks), which are very commonly used are only described and those are not used commonly are not described in this chapter. The rationality behind this description has been justified and made clear by incorporating SGN in both the dimensions, i.e., positively and negatively to avoid unnecessary vastness of the treatise. The properties of such drugs which are not mentioned here can be determined by the predominance of respective Mahabhuta (physical element) in them. In Unmada Nidanam Adhyaya, during the description of Bhutonmada (a type of insanity caused by external factors) and its prognosis, it is stated that Bhutonmada is caused by the agents with three objectives, viz. Himsa (violence or to inflict injury), Rati (affection/love/pleasure) and Abhyarchana (pay obeisance to Gods). The intention of the agent can be determined by the cardinal symptoms in the patient. When the intention of the afflicted agent is violence, then the patient behaves violently, for example, jumps into fire, drowns into water, falls into a pit, strikes himself with weapons, whips, sticks, brickbats, his own fist, etc. He may try to kill himself. Among these three Bhutonmadas, if the intention of the agent is violence, then that Unmada is incurable whereas remaining two are curable. Acharya Chakrapani has commented that gods and others do not enter into the body of patients directly. Only their subordinates possessing identical nature affect the patient to cause respective Bhutonmada. After reading the present original verse, a doubt arises in reader's mind that what is the rationality behind the specific description about only the characters of Bhutonmada caused by violence? This has been justified by incorporating SGN as it is provided for the sake of physician's knowledge because the signs and symptoms of this particular Bhutonmada are so violent that the patient kills himself. Hence, there is an urgent need to identify this condition, protect the patient and educate the attendants of the patient that the condition is incurable. Thus, making it the most important amongst the three types of Bhutonmada, which has been made clear by the commentator. In Rasa Vimanam Adhyaya, after the comprehensive description of six tastes along with their effects on Dosha, three specific substances were explained, viz., Taila (oil), Sarpi (ghee) and Madhu (honey) which alleviate Vata, Pitta and Kapha Dosha, respectively. Among all the alleviating substances for Tridosha, the reason behind specific description of these three substances is because they are best of their kind. This pinpoint description has been substantiated based on SGN in positive aspect. Author has delineated the qualities of each one of them individually in further verses of the same chapter. In Mahatigarbhavakranti Shariram Adhyaya, it is stated that when the ovum and uterus of a female are afflicted by the aggravated Dosha (due to excessive indulgence in the diet and lifestyle provoking them) and when such woman conceives then one or many organs of the fetus derived from the maternal source, viz., skin and blood, get deformed. When the part of the ovum of the mother is responsible for the production of uterus is excessively vitiated, then she gives birth to Vandhya- an infertile female. When the part of the ovum which is responsible for the production of uterus is excessively vitiated, then she gives birth to a Putipraja (the female, who delivers dead fetus). When the fractions of the ovum, which is responsible for the production of uterus as well as the secondary sexual characters such as breast, genital organs, pubic hair, and mustache-beard in the ovum of the mother get excessively vitiated, then she gives birth to a Varta (a child who is not completely female but only possessing the feminine characteristics excessively). Here, only three deformities of a progeny (female child) are described. However, there can be many other such deformities which are left for the Yukti (logic) of a physician. The specific description about the three deformities, viz. Vandhya, Putipraja and Varta is rationalized by the integration of SGN in positive way as they are the most important and might be considered as examples to ascertain various other deformities of female progeny. In Shariravichaya Shariram, Acharya Charaka has enumerated 20 Gunas (attributes) of Sharira Dhatus (body tissues) which account for their increasing or decreasing nature, viz., Guru (heavy), Laghu (light), Shita (cold), Ushna (hot), Snigdha (unctuous), Ruksha (dry), Manda (slow or dull), Tikshna (quick or fast), Sthira (immobile), Sara (mobile), Mridu (soft), Kathina (hard), Vishada (clear or shiny), Picchila (mucilaginous or cloudy), Shlakshna (smooth), Khara (rough), Sukshma (micro or subtle), Sthula (macro or gross), Sandra (dense) and Drava (liquid). It is also stated that with continuous intake of heavy food preparations, the body tissues that are heavy get increased and light ones get reduced. In the same way, all body tissues get increased by the continuous intake of identical food substances and vice versa. Hence, with continuous intake of Mamsa (meat), there is a comparative increase of muscle tissue; simultaneously, there is increase in respective body tissues due to similar kind of food intake. Here the author has emphasized only on the therapeutic actions of Guru and Laghu Gunas because they are explained as examples to understand the therapeutic actions of other remaining attributes accordingly. The pairs of other physical attributes are not described because it leads to unnecessary expansion of the text as well as loss of comprehensiveness of the text. Hence, the present context has been justified by SGN in a positive manner. In Indriyanikamindriyam Adhyaya, it is stated that if a patient perceives the sky as something solid or like the earth and the earth as something void or like the sky, he will surely die as both these symptoms are inauspicious or indicative of imminent death. The need for depicting specifically the symptoms of imminent death in regards to vision is not only due to their prominence but also eyes being the most important amongst the five sense organs. Thus, these citations of illustrations pertained to Chakshurindriya (sense organ of vision) are authenticated by adopting SGN in a positive manner. In Rajayakshma Chikitsitam, three types of Rajayakshma based on the symptomatology, viz., Ekadasharupa (eleven symptoms), Shadrupa (six symptoms) and Trirupa (three symptoms) are mentioned. Eleven symptoms of Rajayakshma is a conglomeration of Kasa (cough), Ansatapa (burning sensation on the shoulders), Vaiswarya (impairment of the voice), Jwara (fever), Parshwashula (pain in the sides of chest), Shiroruja (headache), Raktachhardana (hemoptysis), Kaphachhardana (spitting of phlegm), Shwasa (dyspnea), Varchagada (diarrhea) and Aruchi (anorexia). Six symptoms of Rajayakshma consist of Kasa, Jwara, Parshwashula, Vaiswarya, Varchagada and Aruchi. In this context, author did not emphasize or enlist the symptoms of Trirupa Rajayakshma. This context is made clear by the incorporation of SGN. Trirupa Rajayakshma means any three symptoms of Ekadasha Rupa Rajayakshma may present in the patient. Hence, the detailed description about any three symptoms of Ekadasha Rupa Rajayakshma is not provided. Hence, Acharya Chakrapani has clarified that by following SGN in a negative aspect author has not mentioned the specific three symptoms of Trirupa Rajayakshma. In Vatavyadhi Chikitsitam, the ailments which require careful treatment viz. Sandhichyuti (dislocation of joints), Hanustambha (lock-jaw), Kunchana (contracture), Kubjatva (hunch-back), Arditavata (facial paralysis), Pakshaghata (hemiplegia), Angasamshosha (atrophy of limbs), Pangutwa (inability to walk due to muscular dystrophy), Khudavata (affliction of small joint by Vata), Stambhana (stiffness) and Adhyavata (stiffness of lower limbs) and Asthi-majjagatavataroga (diseases located in bone and bone-marrow) have been described. These diseases can be treated under special circumstances only if they have been recently originated, if the patient is strong and is free from any complications. In the present context, the list of such complications pertaining to incurable Vata diseases is not mentioned by the author as it will be explained in the further verses of the same chapter. HereSGN is used in a negative manner to justify the word 'Nirupadravan' to prevent the text from repetitions, vastness as well as to make it more precise. It is difficult to enumerate the list of complications due to their innumerability as it varies according to disease condition. This may be a reason, that the author indirectly advices physician to be more cautious and think logically. In Yonivyapat Chikitsitam, while describing the dose of medicine it is stated that a little quantity of water cannot abolish or eradicate the fire. In the same way, Aushadha (medicine) in a small quantity cannot cure a disease. The way in which over irrigation is harmful for the crops, similarly medicine in excess quantity is also harmful for the patient. However, the specific quantity of medicine is not mentioned here. Hence, a physician must examine the strength of the patient carefully before administration of any medicine as well as therapeutic measures, and it should be neither too excess nor too less and the dose should be in Madhyama Pramana (moderate or medium). This ismade clear with the help of SGN in negative way that the dosage strictly depends upon several factors such as the intensity, morbidity of involved Dosha and the strength of an individual. It is difficult to mention the dosage of a drug or therapy according to each and every condition. The same concept has been mentioned in Rogabhishagjitiyam chapter of Vimana Sthana. In Yonivyapat Chikitsitam, during the description of Satmya (wholesomeness), SGN is traced out. It is stated that an unwholesome item (food or regimen) becomes Satmya (wholesome) to a person due to its Auchitya (habitual intake) or the nature of Desha (place or habitat), the immediate and incomplete withdrawal of such item even though it is unwholesome does not give comfort to an individual. 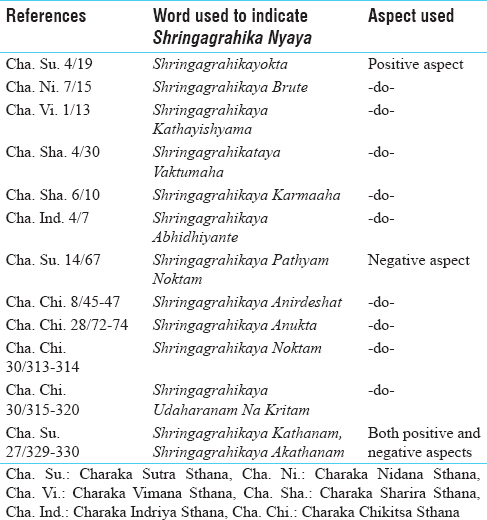 Different types of habituation to different geographical regions are enlisted by Acharya Charakaas given in [Table 1]. It is also stated that the medicine has to be administered for these people along with their habitual or wholesome foods and drinks. The wholesome ingredient provides instantaneous strength and they do not cause any harmful effect even if administered in excess quantity. In this context, Charakadid not specify about Purusha Satmyata (wholesome food and regimen as per individual). Chakrapani in his commentary made this context lucid by the integration of SGN in negative aspect and defined Purusha Satmyata (wholesomeness as per individual) as 'the qualities of food and regimen that are opposite to their geographical region and it may not be fixed and also differs from individual to individual'. Hence, its specific examples were not provided here. Moreover, the same concept has been made clear in Tasyashitiyam Adhyaya. Since antiquity, in Sanskrit rhetoric, lots of maxims have been utilized in different contexts to magnify their works. Based on the existence, they can be divided into two categories, viz., Nyayas in Mula Sutra (maxims in original verses) and Nyayas in Vyakhyana (maxims in commentary). The present one, i.e. SGN comes under the second category as it is found only in the commentary. Even though it is not mentioned directly in original verses of Charaka Samhita, the knowledge of SGN can be applied in different contexts. For example, while stating Pratyatmaniyata Lakshana (cardinal symptom) of a disease or for the pinpoint explanation of the subject. In Ayurveda, many of the diseases possess similar signs and symptoms, out of which the cardinal symptom is helpful for differential diagnosis. Similarly, when it is advised to follow the wholesome diet and regimen in Jwara (fever), patient will not understand what to do? However, if the physician advices to take Shadanga Paniya (medicated water prepared from six drugs) in fever which is a specific advice suitable in Jwara, this satisfies the utilization of SGN. SGN is mainly used in bifocal manner i.e. positive and negative perspective. Among the above described 12 contexts, six are in positive aspect and five are in negative aspect and in one context it has been used in both ways. The details of various contexts indicating the usage of SGN in different ways have been enlisted in [Table 2]. After the thorough analysis of these 12 contexts, it is observed that SGN has been quoted highest times in AD commentary and is a little difficult maxim to understand for an average Ayurvedic scholar as it is stated in two dimensions. SGN is used positively not only for illustrative purpose but also to emphasize the importance of certain points such as clinical essentiality of 50 Mahakashayas for lower intellectuals; severity of Bhutonmada caused by violence; importance of three substances, viz., oil, ghee and honey which alleviates Vata, Pitta and Kapha respectively. SGN is also used negatively as a rule to justify the context, prevent Tantra Dosha (textual errors) and preserve Shastra Lakshana (qualities of the best treatise). The maxims are applied in Ayurvedic literature like mathematical formulae to help in exploring the concealed concepts, facts of the science and understand the original intention of the author. SGN has been used by Chakrapani as a tool to decode the hidden meaning of various verses in Charaka Samhita. It has been mainly used to avoid the two Tantra Dosha (errors in treatises), i.e. Punarukti (repetition) and Ativistara (unnecessary expansion of the text), ultimately contributing in the precision and crisp presentation like that of an ideal scientific text. It also highlights the important aspects of the subject in a group of similar ones and can be applied to understand the underlying principle in the narration of subject matter. Hence, it necessitates the essentiality of SGN's knowledge for every scholar to get valid and authentic apprehension of Ayurvedic treatises, especially Charaka Samhita for better understanding as well as successful implementation of Ayurvedic concepts. Acharya YT, editor. Charaka Samhita of Agnivesha, Vimana Sthana. Ch. 8. Ver. 6. Reprint edition. Varanasi: Chaukhamba Orientalia; 2015. p. 262. Acharya YT, editor. Sushruta Samhita of Dhanvantari, Chikitsa Sthana. Ch. 28. Ver. 27. Reprint edition. Varanasi: Chaukhamba Orientalia; 2008. p. 502. Acharya YT, editor. Charaka Samhita of Agnivesha, Sutra Sthana. Ch. 1, Ver. 23. Reprint edition. Varanasi: Chaukhamba Orientalia; 2015. p. 6. Available from: https://www.literaryterms.net/maxim/. [Last accessed on 2018 Mar 01]. Available from: https://www.thoughtco.com/what-is-a-maxim-1691372. [Last accessed on 2018 Sep 13]. Chinthala R, Kamble S, Baghel AS, Vyas H, Bhagavathi NNL. Significance of Nyayas (Maxims) in understanding philosophical aspects of Ayurveda: A critical review. J Res Educ Indian Med 2018;24:81-92. Rajkumar C, Bhagavathi NNL, Vidyanath R. Role of Nyayas (maxims) in understanding Ayurvedic concepts of Brihattrayee with special reference to Chatrinogacchantinyaya: A literary review. Int J Res Ayurveda Pharm 2017;8 Suppl 1:27-31. Dev R, editor. Shabdakalpadruma, Vol 5. Reprint edition. Varanasi: Chowkhamba Sanskrit Series; 2011. p. 133. Williams M, editor. Sanskrit- English Dictionary. Reprint Lithographic edition. Great Britain: Oxford University Press; 1956. p. 1087. Acharya YT, editor. Charaka Samhita of Agnivesha, Sutra Sthana. Ayurveda Dipika Vyakhya, Sanskrit Version. Ch. 4. Ver. 19. Reprint edition. Varanasi: Chaukhamba Orientalia; 2015. p. 34. Acharya YT, editor. Charaka Samhita of Agnivesha, Sutra Sthana. Ayurveda Dipika Vyakhya, Sanskrit Version. Ch. 14. Ver. 67. Reprint edition. Varanasi: Chaukhamba Orientalia; 2015. p. 92. Acharya YT, editor. Charaka Samhita of Agnivesha, Sutra Sthana. Ayurveda Dipika Vyakhya, Sanskrit Version. Ch. 27. Ver. 329-330. Reprint edition. Varanasi: Chaukhamba Orientalia; 2015. p. 172. Acharya YT, editor. Charaka Samhita of Agnivesha, Nidana Sthana. Ayurveda Dipika Vyakhya, Sanskrit Version. Ch. 7. Ver. 15. Reprint edition. Varanasi: Chaukhamba Orientalia; 2015. p. 224-25. Acharya YT, editor Charaka Samhita of Agnivesha, Vimana Sthana. Ayurveda Dipika Vyakhya, Sanskrit Version. Ch. 1. Ver. 13. Reprint edition. Varanasi: Chaukhamba Orientalia; 2015. p. 233. Acharya YT, editor. Charaka Samhita of Agnivesha, Sharira Sthana. Ayurveda Dipika Vyakhya, Sanskrit Version. Ch. 4. Ver. 30. Reprint edition. Varanasi: Chaukhamba Orientalia; 2015. p. 321-22. Acharya YT, editor. Charaka Samhita of Agnivesha, Sharira Sthana. Ayurveda Dipika Vyakhya, Sanskrit Version. Ch. 6. Ver. 10. Reprint edition. Varanasi: Chaukhamba Orientalia; 2015. p. 331. Acharya YT, editor. Charaka Samhita of Agnivesha, Indriya Sthana. Ayurveda Dipika Vyakhya, Sanskrit Version. Ch. 4. Ver. 7. Reprint edition. Varanasi: Chaukhamba Orientalia; 2015. p. 360. Acharya YT, editor. Charaka Samhita of Agnivesha, Chikitsa Sthana. Ayurveda Dipika Vyakhya, Sanskrit Version. Ch. 28. Ver. 72-74. Reprint edition. Varanasi: Chaukhamba Orientalia; 2015. p. 620. Acharya YT, editor. Charaka Samhita of Agnivesha, Chikitsa Sthana. Ayurveda Dipika Vyakhya, Sanskrit Version. Ch. 30, Ver. 313-314. Reprint edition. Varanasi: Chaukhamba Orientalia; 2015. p. 648. Acharya YT, editor. Charaka Samhita of Agnivesha, Vimana Sthana. Ch. 8, Ver. 94. Reprint edition. Varanasi: Chaukhamba Orientalia; 2015. p. 276. Acharya YT, editor. Charaka Samhita of Agnivesha, Chikitsa Sthana. Ayurveda Dipika Vyakhya, Sanskrit Version. Ch. 30, Ver. 315-319. Reprint edition. Varanasi: Chaukhamba Orientalia; 2015. p. 648. Acharya YT, editor. Charaka Samhita of Agnivesha, Sutra Sthana. Ch. 6, Ver. 50. Reprint edition. Varanasi: Chaukhamba Orientalia; 2015. p. 48.